CitySip and New York Champagne Week founder, Blaine Ashley (who's also one of Shoes N Booze's fave bubbly personalities), is shining the spotlight on another sparkling wine with the first annual Prosecco Pop Up. This year's event will feature a month of curated Prosecco promotions at East Village restaurant & bar, IN VINO. Throughout the month of February the menu will feature suggested antipasti pairings and specially selected by-the-glass and bottle options. 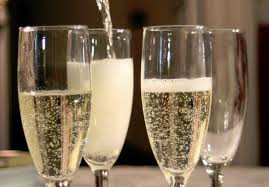 During Valentine's Day weekend, all guests will receive a complimentary glass of Prosecco to enjoy with their dinner. Additionally, Blaine will partner with owner and beverage director, Keith Beavers to co-host IN VINO's Drink Lab on February 2nd and February 16th, entitled Prosecco: Getting to Know the Bubbs You Love. A $25 ticket will offer attendees the chance to sample a variety of Prosecco brands while learning what the fizzy sipper is all about. Snag your ticket HERE.